How cute are these? If you’re looking for a really simple Christmas decoration or even a fun gift from your kids, this idea from Easy Peasy and Fun is perfect! It’s also great for using up some of those stray odd socks we all have. Fill your sock with rice until you have a nice fat ball with a little bit of give (this will probably take more rice than you expect!). Tie the top with an elastic band, or sew together. Place another band just above the middle of the snowman, so that the bottom half is slightly bigger than the top. Glue buttons to the bottom side with a glue gun or glue dots. Draw on the mouth and eyes with a black marker or pain. You can also add rosy cheeks and any other details you want. Add a ribbon for the scary and glue to secure. Cut the coloured sock and roll up the edges to make a hat. Secure with glue if need be. 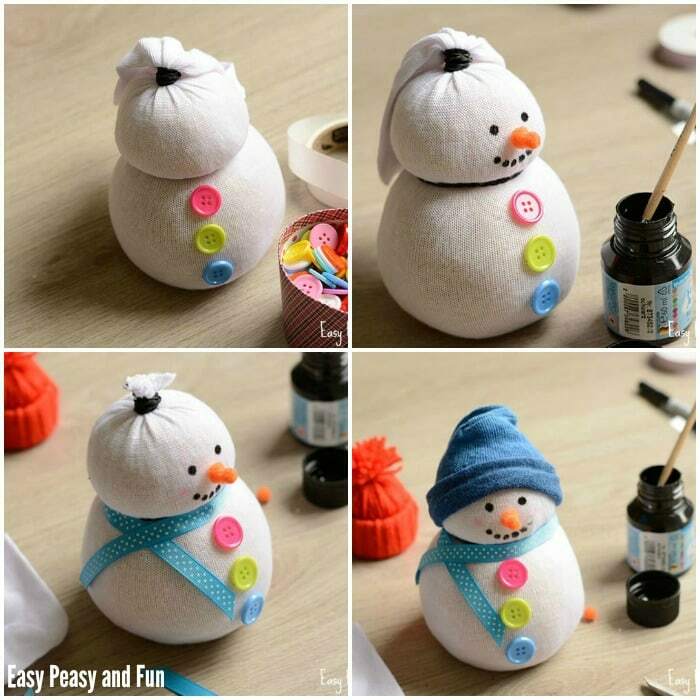 Why not make a few and have your own snowman family?